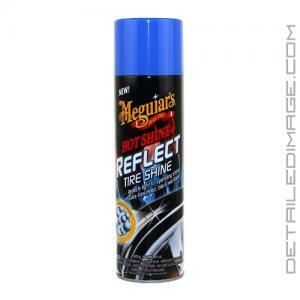 Meguiar's Hot Shine Reflect Tire Dressing is an easy to apply spray on tire dressing that will have your tires looking super glossy! Reflect features a unique formula that helps light actually reflect off the surface of your tire once it is applied. This takes the wet look everyone strives for and really enhances the results. Simply take the Reflect can, remove the top, and spray onto your desired area. Application is really is that simple! Reflect will level out, so you will not have any streaks or uneven application marks. In just seconds you will have an incredibly glossy finish that will have heads turning and people asking how you got your tires looking so wet. If you do have any overspray on the paint wipe away with a clean microfiber towel asap. If you want to bring your tries to the next level, pick up the Meguiar's Hot Shine Reflect Tire Dressing today! One of a kind shine! Using proprietary reflective technology we have created a tire dressing unlike anything you have ever seen. Meguiar's Hot Shine Reflect Tire Shine delivers the same deep, black wet look shine that you love yet when light hits your tires you get a unique, sparkling shine. Our exclusive formula levels evenly and quickly to prevent streaking, then bonds to the tire to create a long-lasting shine. Lesser products drip and run, leaving unsightly streaks and marks when they dry. Hot Shine Reflect includes water resistant polymers, enhances resin technology and premium silicones to protect and keep your tires black & shiny for weeks. DIRECTIONS: SHAKE WELL BEFORE USING. Apply on a cool, clean and dry tire in a well ventilated area. Hold can 4 to 6 inches away and spray directly onto tire in a thin, uniform pattern - to prevent spin-off. Do not over apply. Immediately remove overspray on wheels and paint. NOTE: Use only as directed. Do not apply to painted surfaces and plastic panels. If necessary, remove spin-off from plastic and painted panels to avoid staining. Awesome product. You get a real wet look with the added effect of the shimmer when the sun hits it. Looks awesome and like nothing you have seen in a tire shine before. This is my new go to tire shine . Easy to use, the shine is not quite as "bright" or "reflective" as I had hoped, but it looks pretty good. This product is to oily looking. For my customers we try to make the tires shine without the oily look. Your customer service is, bar none, the best of any internet business I've dealt with...and you can quote me on that.